About 7 years ago, I ditched most of my commercial face products and started making my own using natural carrier and essential oils. I was tired of the chemicals, hefty price tags and less-than-stellar results. Just like when you switch to a natural shampoo, there is a transition period in getting your skin used to DIY face products. I started slowly, toughed out the initial blemishes and now I couldn’t be happier with the way my skin looks. I never wear concealer, foundation or powder anymore. Honestly, I used to wear TONS and never left the house bare-faced. Every time I make my face lotion, it’s a bit different. Here is my latest recipe, which uses two carrier oils and 4 pure, therapeutic-grade essential oils. Jojoba oil (3 parts): this oil is great for all skin types, has anti-inflammatory and antibacterial properties. Red raspberry seed oil (1 part): contains natural sun protection and “moisturizes the skin, improves elasticity, reduces wrinkles and fine lines” (source). Frankincense (5 drops): helps preserve a youthful complexion, cell regeneration and tighten pores. Cypress (2 drops): helps tighten pores. Geranium (1 drop): helps cell regeneration and tighten pores. Tea Tree (2 drops): good for oily skin and skin blemishes. In the past, I’ve also used Grapeseed oil, Argan oil and Coconut oil as carrier oils. There are plenty of options you can try depending on what type of skin you have and the desired effect(s) you are looking for. 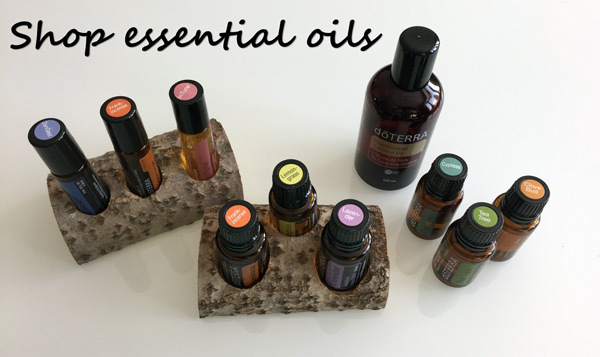 Other wonderful essential oil options to use in your face lotion based on your skin’s needs include Clary Sage, Jasmine, Lemon (photosensitive*), Myrrh, Neroli, Patchouli, Petitgrain, Rose, Sandalwood, Cedarwood, Bergamot (photosensitive*), Cypress, Juniper Berry, Lavender and Rosemary. BTW – I’m super picky with my essential oil brand as I don’t want any synthetics, fillers or additives on my skin. Otherwise, what is the point? Plus, you likely won’t experience the benefits listed above. I’m also not big on complicated or overly precise recipes… I just made sure to have a 1 % dilution of essential oils based on a 50 ml glass bottle, as shown in the video. If it were any more complex, I likely would not do it! My time is way too valuable. About 6 drops is all you need for your face. Add a few extra drops if you also want to moisturize your neck and chest. *Caution: Lemon and Bergamot (and all other citrus essential oils) are photosensitive, which means they can cause you to burn more quickly if you are exposed to the sun or a tanning bed. When using citrus oils topically, stay out of the sun or tanning beds for a minimum of 12 hours.